Woodbridge, United States - March 27, 2019 /MarketersMedia/ — The growing popularity of an active lifestyle has influenced many couples to explore the great outdoors together. New experiences, such as hiking hidden trails, summiting unknown mountaintops, or sleeping under the stars, are known to be bonding, drawing people together over shared memory. The rise in popularity of an outdoor lifestyle has seen couples adding survival gear ahead to their wedding registries. Tents, sleeping bags, and coolers are favorite additions to wedding registries. Safety is also a significant concern for outdoorsy couples. Thus, it is a must for many that they include a first aid kit on their wedding registry. Surviveware’s latest product innovation, their Large First Aid Kit, contains 200 first aid provisions inside a water-resistant 10” x 7.25” x 5” bag, which kit owners can use to treat and stabilize injuries. Despite the number of contents stored inside the package, the bag still has space for additional supplies such as an Israeli bandage, CAT tourniquet, fire starter, sunscreen, Epi-pen, and prescription medication. One of the noted features of this expanded first aid pack is that it has labeled compartments that keep the supplies in place. With organized partitions, owners can quickly retrieve the needed provisions without spilling or rummaging through the contents of the kit as the labels help identify the usage of each item and the ideal capacity of each pouch. 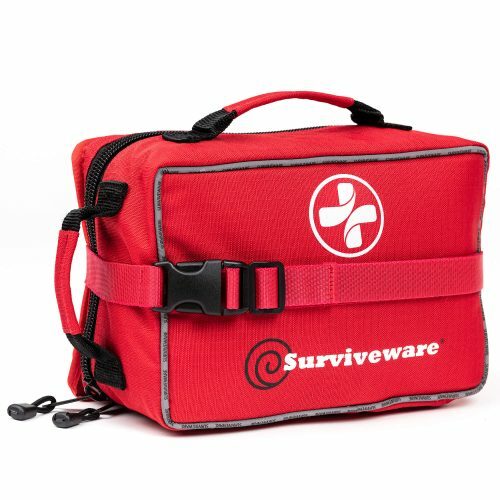 Surviveware made sure that the Surviveware Large First Aid Kit is conveniently accessible and portable for its users. Each kit comes with MOLLE-friendly straps that keep the bag in place. The straps can be attached to a car’s headrest, a camping chair, a rucksack, or a Jeep roll bar. In addition to the snap-on, this large first aid kit also has a durable top handle which enables the bag to be hand-carried anywhere. Enable your favorite outdoorsy newlywed couple to safely explore the world by giving them this Large First Aid Kit from Surviveware. Order one today for an exclusive 20% discount when you use a Surviveware Amazon coupon. Take advantage of this limited time offer today by clicking here.